I sent the mod off to a friend of mine and he is working on the template. He found a few holes and double mapped parts in the body that he is fixing. So when all is done we will have a template and a new cleaned up body 3d gmt file. I can completely relate my dad had a copper 260z when I was a kid, and I have many fond memories of that car. Thanks for this good news, VR ! And I feel very happy to read your warm story. This will be most excellent! Oh Yes!!! +1 to that! Hate to ask and be pushy, but any updates on the templates? I'd love to do some skins for this car. Rest assured my friend Is working on it. It does take some time to do the fixxes and map the whole thing. And of course life has a way of getting in the way every now and then. I'm sure the wait will be worth it in the end. Thanks for the update VR! I can certainly wait, especially if real life gets in the way. I just wanted to make sure this car had not been forgotten. When the template is done I'll do my best to do the two BRE 240Zs. If I'm not able to do it at that time I'll release the template and updates so someone else can have a crack at it. Dan, I've been sending messages to you. Did you recieve them? I just replied to the latest one. Sorry it has been so long to update you on this. Things have progressed quite nicely so far. We have a very good working template now. 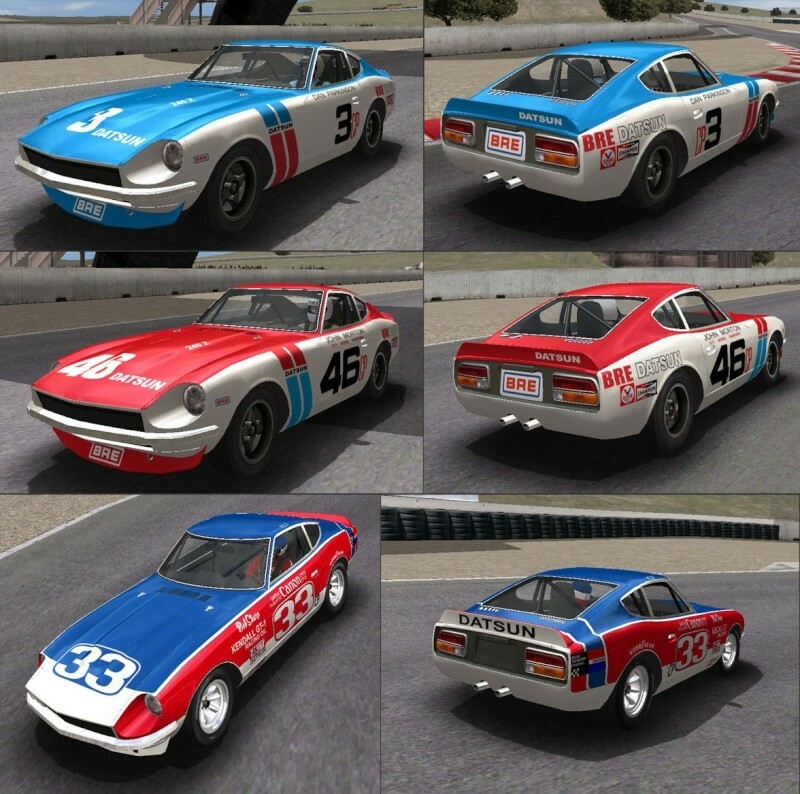 And as promised I have built a few racing skins. There is still a little more work to do though. The more I dig in to this mod the more I find little things I want to improve. So this has turned from just a template to a fairly extensive update to the mod. Oh well what else is new for me, I just can’t leave well enough alone. Of course all chassis, front and rear spoilers, and the taillight panel are now mapped so that they are paintable. I feel like I’m forgetting something, but you get the Idea; LOTS of updates. Here is a teaser shot to wet your appetite. Great news - and progress - thanks for the update! Thanks for taking the time to improve on this. I hesitated to do more since not having a template was the major problem. They're beautiful VR and definitely show the amount of time you spend on them! Now I have to try and make my personal car. Hate to dig up an old thread, but does anyone know what happened to Vintage Racer? I would love to see his work on these cars finished, and if anyone knows how to reach him I'd like to see if I could finish where he left off. Maybe if you try a PM to him? I have no contacts with him for last months. That was my first thought, but it said his last sign in was February so I figured the chances of him responding were unlikely. I hope all is well with him.